What is essentially a continuation of their current systemwide global promotion that we have seen all year, Hilton Hotels will be offering double points on all stays Worldwide for the remainder of fall and for the start of winter Once again there are no hotels that are excluded however just like the summer version, the promotion does not give the option of double miles so if you choose to earn miles for your Hilton stays you will only earn the base amount. August 30 Update: Aeroplan eStore adds more retailers, less than a week left on our exclusive TD Aeroplan Infinite offer and more! A quiet first couple of days this week on Rewards Canada, probably got to do with back to school and the summer vacation season coming to end. I see a major onslaught of posts, offers, news and more coming after the Labour Day holiday! Doing some last minute Back to School shopping online? Aeroplan's eStore has added over 20 new retailers that you can earn miles for shopping online at. Find the list of new stores here. 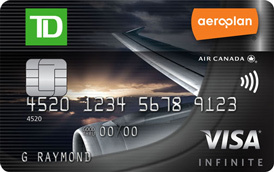 There is less than a week left to jump on Rewards Canada's exclusive Double Miles offer with the TD Aeroplan Visa Infinite card. You may want to get in now as we know the next TD Aeroplan offer will have a higher sign bonus but will not be first year free. If you want some more Aeroplan miles at absolutely no cost then go for it now. Find our more about our TD Aeroplan offer here. • Annual Fee Rebate for the first year (Primary Cardholder only) – that’s $120 in savings! • REWARDS CANADA EXCLUSIVE - For every $1 spent on eligible gas, grocery, drugstore and aircanada.com Purchases with your Card5, earn double Aeroplan Miles for the first 90 days after Account approval – that’s 3 miles instead of 1.5 miles for every $1 spent on eligible Purchases3. You have a little over a day left to enter our second contest with Marriott International! You can win up to 30,000 Marriott Rewards points! Enter by August 31st. Click here for complete details and to enter the contest! Marriott Rewards has released the details of their Fall MegaBonus Promotion which offers two reward options for your upcoming Marriott stays. With the Choose your Reward version of MegaBonus, Marriott Rewards members can choose to either earn 5,000 bonus points after their second stay or to earn 10,000 bonus points after every 10 paid nights (maxing out at 50,000 points). Don't forget to enter our Marriott contest as well! You could win up to 30,000 points! Enter here. For even more Marriott Rewards bonus point offers visit here! 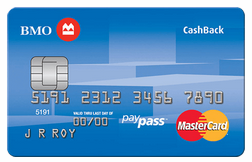 The BMO No Fee Cashback MasterCard has had its sign up bonus of up to $75! Receive $25 in CashBack rewards after your first purchase, plus an additional $50 when you spend $1,500 in the first three months. Not bad for a no annual fee card. 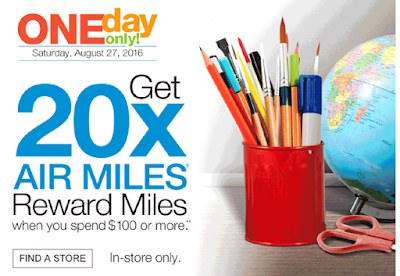 Just in time for back to school shopping, you can earn 20x AIR MILES Reward Miles for shopping at Staples this Saturday. The one day offer is only good for in-store purchases of $100 ore more. 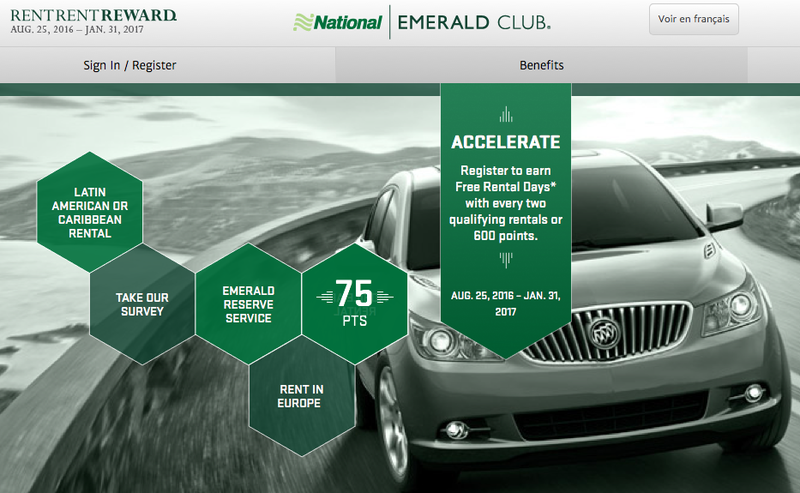 One of the best Car Rental Reward program promotions, National Emerald Club's One Two Free (US) / Rent Rent Reward (Canada) has returned. Once again there is a U.S. version and a Canadian version. The Canadian version is slightly better than the U.S. version on the rental portion as Canadians can credit Canadian and U.S. rentals towards the promo whereas their U.S. counterparts can only credit U.S. rentals (although both versions have a 300 point offer for Latin America/Caribbean and European rentals as well). You can also earn points for opting in for emails, downloading the mobile app and more. We know many of you are perturbed with AIR MILES right now due to the whole expiring miles issue and no being able to get through to AIR MILES customer service to redeem. But as we mention in our Guide to AIR MILES Expiry, one way to keep your miles from expiring is to achieve Onyx status. One of two routes to get that Onyx status is to earn 6,000 AIR MILES Reward Miles in a calendar year. Maybe you are getting close and need a little boost to reach it, well BMO has brought back their awesome 800 AIR MILES Reward Miles sign up bonus for the their no fee AIR MILES MasterCard. That's right, you can earn 800 miles just for getting the card. Much better than the 500 that ended yesterday and way better than the double miles it offered earlier this year. Even if Onyx isn't your goal and you are a happy AIR MILES customer this is an easy way to increase your balance for your next reward. Be sure you enter our second contest with Marriott International! 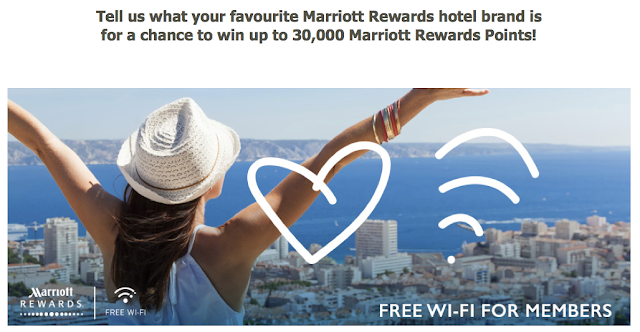 You can win up to 30,000 Marriott Rewards points! Enter by August 31st. Click here for complete details and to enter the contest! Choice Hotels has revealed the details of their fall promotion and low and behold its pretty much the same as they always run! That being said, it is a decent promotion and is today's bonus offer highlight. The only difference we can see this time is they are promoting multiple free nights, that is you will earn enough points for an 8,000 point redemption after every two stays completed. So in reality you can redeem for higher hotel categories if you complete 4, 6, 8 stays etc. Depending on what you spend this bonus offer can be quite lucrative if you frequent Choice Hotels. Starwood Preferred Guest has revealed the details of their next systemwide promotion called More for you. The promotion will offer double Starpoints for stays of two or more nights on weekdays and triple Starpoints for stays of three or more nights on weekends. What we don't know yet is whether all Starwood locations will be participating as we see in some of their promotions or if their will be properties that choose not to participate. Registration for the promotion starts on September 12th and all your eligible stays between September 12 and December 18 will count towards the promotion. So you can start booking now at SPG.com. August 23 Update: Enter to win up to 30,000 Marriott Rewards Points, new AIR MILES Prize Pool promo and more! We've launched our second contest with Marriott International! Once again you can enter to win up to 30,000 Marriott Rewards points! Enter by August 31st. Click here for complete details and to enter the contest! 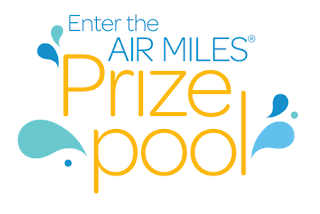 AIR MILES has launched a new contest and bonus miles promotion called AIR MILES Prize Pool. Every offer you take advantage of from the promotion (ie shop at retailers and get bonus miles) earns you an entry to win Flights, Cruises, AIR MILES Reward Miles and more. Find out more here. Also if you need a boost to your IHG Rewards Club points balance for an award check out the buy points bonus of up to 80% below. Not as good as the 100% we see often so I would only take advantage of this if you really need to top off for an award night. - Various Bonus Starpoints or Free Nights when you complete eligible stay(s) at Starwood Hotels Worldwide. More... * Targeted Offer - may not work for everyone Until ?